The competition all goes down this weekend in Montreal, and FloGymnastics will be live-streaming all of the elite competitions. The meet starts with the Gymnix Challenge Qualifications, running from Friday to Saturday. The Junior International Cup follows this on Saturday evening, and the competition finishes on Sunday afternoon with the finals. The Gymnix Challenge is an individual competition in which athletes compete to qualify for event finals. Several major clubs in the USA are sending gymnasts to this meet, including Hill’s, Buckeye, WOGA, Cincinnati, and Everest, to name a few. Canada has also sent a star-studded list of individuals, as has France, Mexico, and others. 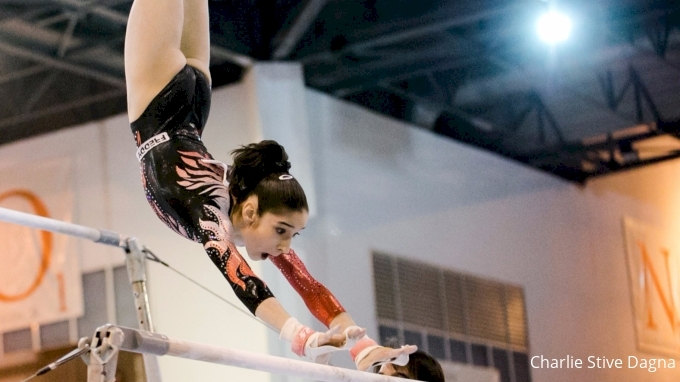 The Junior Cup consists of a team competition, plus each individual gymnast is able to compete for the event finals as well. This year, countries who have sent teams include Canada, Germany, Italy, Russia, Japan, and Belgium. This is an exciting international elite competition early in the season, and we’ve highlighted some of the action to watch out for below. USA usually sends several juniors to compete in the Junior Cup, in addition to sending individuals to compete in the Challenge. This year, USA is not sending a Junior Cup team, although there are more individuals competing in the Challenge than in years past. One of the clubs sending quite a few gymnasts is WOGA, which has a total of six athletes competing. One of the gymnasts competing is Audrey Davis, who just showcased her routines at the February elite verification camp. Another WOGA gymnast to watch out for is Irina Alexeeva, who placed first in the all-around at the U.S. Classic in 2016. Alexeeva is one of WOGA’s best bar workers due to both her form and her difficulty level. At the 2018 WOGA Classic, she scored a 14.1 on her routine, which includes a stalder to toe-on full to Van Leeuwen combination. Her routine is also packed with release moves. In addition to the Van Leeuwen, she boasts a piked Jaeger, Pak salto, and a Maloney straight to a Gienger in between the bars. She’ll be looking to make it to the bars event finals for sure. Another prestigious club from the U.S. sending a few gymnasts is Hill’s. Kayla DiCello and Madeleine Johnston will be competing. DiCello recently had a great showing at the February verification camp, where she qualified to compete at U.S. Championships. Her bars was super solid, with good difficulty and very clean form. Everest will also be sending three gymnasts, and Cincinnati is sending two gymnasts, including Emily Gaskins, who switched back to Cincinnati last year after training with Steve Nunno. Gaskins is a solid all-around gymnast, but she showed off some great skill on floor at last year’s U.S. Classic. Her passes last year were a double layout, full-in, double Arabian, and double pike. In the Junior Cup, Italy will be sending a team made up of some of their best junior gymnasts: Asia D’Amato, Alice D’Amato, Elisa Iorio, and Giorgia Villa. Villa recently placed first in the all-around at the 2018 1st Italian Serie A, scoring a 54.350. Asia D’Amato finished just behind her with a 54.250, and Alice D’Amato took third place with a 53.450. The four gymnasts competed for Team Brixia and finished with a healthy lead over the competition. Asia and Alice D’Amato are powerful vaulters, both competing strong Yurchenko doubles. Asia took the gold medal at the 1st Italian Serie A with a big 14.95, with Alice capturing the silver with a 14.75. In the team competition, Asia scored an impressive 15.05 on the apparatus. Villa is strong across all four, but she has proven lately that she is one to watch on bars especially. In the team competition, she scored a 14.5 on the event, the highest score on bars in the entire competition. Some of Canada’s top elites will be competing at Gymnix on their home turf, including 2016 Olympian Shallon Olsen. Olsen is no stranger to International Gymnix; in fact, she has won the gold medal on vault four times, from 2013-2016. Olsen scored a 14.3 to win the vault title by a comfortable margin at the recent Elite Canada, and she’ll likely be looking to add Gymnix vault gold medal No. 5 to her count this weekend. This will be Olsen's last year competing at Gymnix before she joins the University of Alabama gymnastics team next year. Two fellow Olympians will join Olsen at Gymnix — Isabela Onyshko and Rose-Kaying Woo. Woo recently won the bronze medal in the all-around at Elite Canada, totaling a 53.874. She is great to watch on bars; her routine starts with a combination of a toe-on full to Tkatchev to Pak salto. Onyshko finished first in the all-around and on bars and beam last year at Canadian Championships. Onyshko is capable of competing very difficult skills on beam. At last year’s worlds, she was training a back handspring to back with a full. It will be exciting to see her back in competition this weekend.